H: Just returned from my first steelhead trip on the Salmon river in Pulaski, NY. I wasn't sure what to expect. 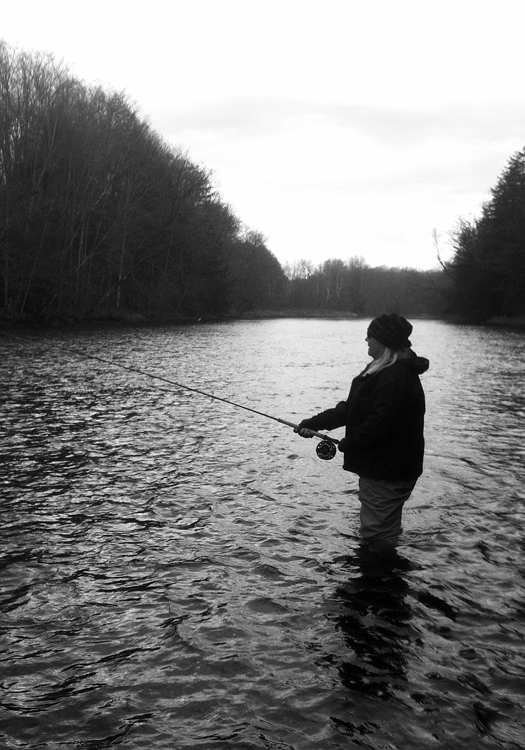 I'd heard so many horror stories, seen pictures and videos of anglers elbow-to-elbow on the river... I expected my experience to be marred by horribly crowded conditions and rude anglers. But somehow expecting the worst, yet hoping for the best, resulted in a great trip! I caught some beautiful steelheed, enjoyed the cameraderie of fellow Juliana's Anglers, Shannon Brightman and Kathleen Clayton, and made some new friends on a lovely river that I hope to fish again very soon. We arrived late Friday afternoon and settled into the 1880 House, our home for the next few days. Linda Tarbox, the owner, her daughter Dawn, and granddaughter Hannah, are the nicest of people and made us feel very welcome. Later that evening, as we walked back from dinner at the River House, I was shivering in my usually warm and toasty down coat. I started to worry about how I would handle the cold temperatures on the river the following morning. Got up around 5:40 Saturday morning, after Shannon and KC left to meet their guide. 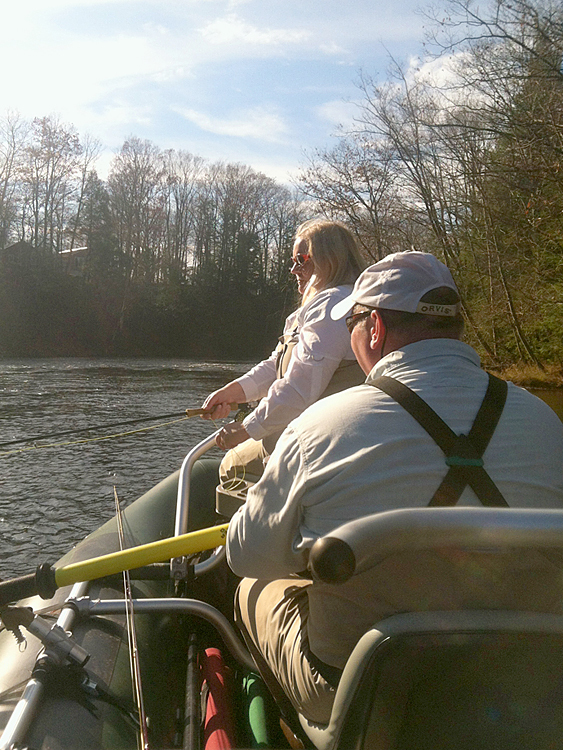 The two of them were floating the Salmon river with Paul Conklin. After donning every warm layer I had brought with me (5 on top, 3 on the bottom, plus waders), I met my guide, Lou Guerrieri (Linda's recommendation), and we drove to the Douglaston Salmon Run. Lou had forewarned me that it would be a good hike down to the pool we'd be fishing. It was chilly (high 30s) but not nearly as cold as I had feared. Still, I relished the thought of warming up with a brisk hike. We parked in the DSR lot and Lou started assembling his gear. He grabbed a portable folding chair from the back of his SUV and began to strap it to a large, heavy-looking backpack. I was concerned he might have a hard time carrying everything down, so I said, "Lou, there's no need for you to bring a chair for me. I can sit anywhere." He replied somewhat sheepishly, "Actually, the chair is for me. I have a bad back..." I chuckled at my wrongful assumption and we began our hike to the Salmon river. I never heard the starting pistol but clearly the race was on, as every angler in the lot rushed down to claim the best spots on the river. Lou is no spring chicken and years of smoking has taken its toll on his health and fitness. Hunched over with the huge pack and chair strapped on this back, he reminded me of a giant tortoise, slowly but steadily walking the trail. I stepped aside numerous times to let other anglers pass by (slow and steady wins the race... ;). We talked most of the way down and I knew right away that we'd get along. Lou is a direct, no nonsense guy with a quick sense of humor. 20 mins. later we arrived at the Meadow. It was already filled with 8-9 anglers. Fortunately, Lou knew a contingent of them, a group of 5 italian gentlemen from Montreal and Miami: Pietro, Nuncio, Fabio, Claudio... They were old clients of his who he'd become friends with over the years and they had claimed a prime stretch of the pool. I was pleased to see several of them fishing with two-handed rods. Lou spoke with a couple of them and they shifted positions to make room for me. It took a while for me to feel comfortable casting in such close quarters with anglers above, below, and directly across from me. I'd already told Lou that I wanted to swing flies with my switch rod. 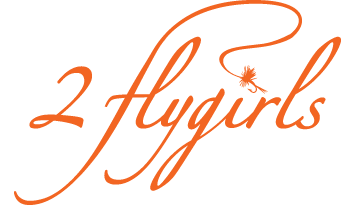 He attached a tippet ring to the end of my leader then tied on the first of many, many flies I would cast that day: an orange flesh fly to start with. For the first couple of hours, the only hook-ups were by Pietro, who due to a bum shoulder was using a spin rod and egg lure. He hooked three and landed one. I fished the same 40-foot stretch of river for quite some time, granted I had swung at least 6 different flies through there. I found it odd that none of guys were interested in moving and covering water. They were content to stay in one spot. I asked Lou about this. He spoke to Pietro and we switched spots. 6 pounds of fresh chrome from Lake Ontario. Lou tied on a big white streamer which sucked up water like a sponge. It was a real clunker to cast with my compact scandi line. But several swings later, I felt an aggressive take. 10 minutes and several jumps later, I landed my first Salmon river steelhead, a 6-pound silvery male, fresh from nearby Lake Ontario. As Lou netted the fish, I noticed "Team Italia" had gathered around me. I received 6 very enthusiastic high-fives, as they admired my catch. His fins were pale and translucent! Afterwards, we celebrated with some hot freshly brewed espresso along the river bank. I can definitely get used to fly fishing, Italian-style ;). We stayed at the Meadow all day. I didn't really mind. It seemed an ideal ambush spot for fresh steel entering the river despite my seeing only 6 other hook-ups all day. Later on, I played another steelhead, this one hooked on a silver doctor fly. It took me into my backing as I walked down river after it. I knew immediately that this one was big brother/sister to the first. Unfortunately, it resulted in a SDR (short distance release), about 10 feet from Lou's net. I rushed it, lost focus for a moment, and the hook came out. Lou said it was about twice the size of my first fish. After making over 200 casts and swinging at least 15 different flies, I was done. Plus, I looked forward to sharing some good river stories with the girls. Thank you Lou (and Team Italia) for a very enjoyable day on the river! I returned to find Shannon taking a well deserved nap. KC had apparently gone back to the river for round 2. I was disappointed to hear that neither of them had caught a fish and that there had been some miscommunication with Paul about needing our car as a shuttle. Hence, their trip had been cut a bit short. Plus, they had nymphed all day (not exactly my idea of fun ;). Dinner that night at the 1880 House was a veritable feast—some of the tastiest prime rib I've ever had—along with great company from fellow anglers staying at the inn. I went to bed completely stuffed, exhausted, and dreamt of steel :). Shannon and Paul (our guide and taxi driver ;). 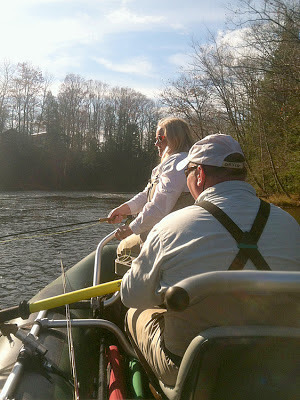 Sunday was my turn to fish with Shannon and Paul. We met at 5:40, dropped off my car at the take-out point, then drove to the put-in at Pineville. It was still dark when we boarded our "river taxi." It was incredibly peaceful drifting down in semi darkness. It wasn't long before we made our first stop. Paul set Shannon up to nymph from the raft. She had left her wading staff back at the inn, and with a bad knee, she wasn't very comfortable wading. I walked below them and started to swing a fly that Paul had tied on. He called it mahagony. I had covered about 80 feet of river, slowly working my way down, when suddenly an angler stepped in about 40 feet below me. I stopped in my tracks but continued to cast, waiting for him to do his thing. He made a couple of casts, fussed with his fly for a bit, then he didn't do much of anything for quite some time. I realized he was now a permanent fixture, a river obstruction, so I walked back up to Paul and Shannon and we boarded the raft in search of our next fishing spot. As we're drifting, Paul pointed out steelhead after steelhead spooked by the raft. We passed one section where apparently quite a few fish were stacked. It was too good to pass up. The new Mistress of Spey, Shannon Brightman. I had mentioned to Paul that Shannon had taken a spey lesson with me and that she had picked it up very quickly. He rigged his Echo 3 spey rod and worked with her on her casting. I hung out with them for a while and watched Shannon double spey. Once again, she exhibited a natural aptitude for casting a two-handed rod and Paul turned out to be a good patient teacher. Eventually, I decided to get back to fishing. I walked well down river from them and proceeded to swing the same mahogany fly. I'd covered about 120 feet of water when suddenly I had a take and my line started flying off the reel. Before I knew it, I was into my backing. 13 pounds of pure fun! My handsome 34-inch Salmon river steelhead buck. He was big, dark, and handsome: a 34-inch, 13-pound buck. But he had a bit of a gut ;). His stomach must have been stuffed with salmon eggs. I had a hard time grabbing hold of him. I'm still amazed he was able to perform those incredible acrobatic feats. The rest of the day passed by in a blurred state of contentment. I enjoyed drifting the river and discovering her many different sides. Paul seemed to know every run, pool, tributary, and guide that we passed by and his raft was the sweetest ride on the river, as other drift boats clanked their way down due to low water. I enjoyed watching the new Mistress of Spey, Shannon, make leaps and bounds in her casting. 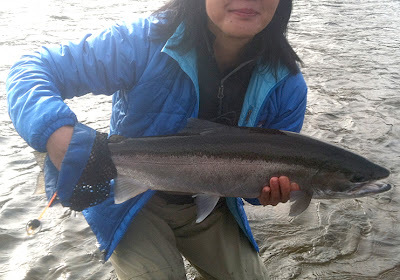 I was thrilled when she caught her first steelhead, a petite silver beauty, but I had hoped she would experience the rush of landing a buck like mine. I was happy just working on my spey casting and made major progress towards earning my CG badge ;). I don't think anything could have ruined that day on the river for me, not even the smell of death all around me (the putrid stench of decomposing salmon). Perhaps if I'd been elbow-to-elbow with rude anglers... But then, I would have just left for another stretch of river. 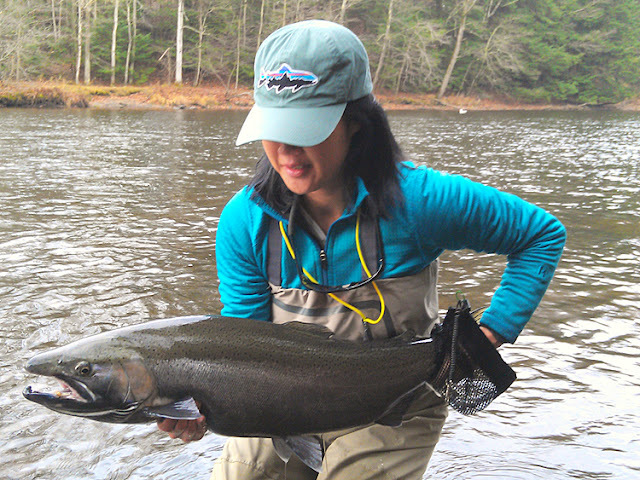 Thank you Paul, Shannon, and my magnificent steelhead! It's funny how a day on the river and a couple of beautiful fish can make everything seem right for a moment in time.